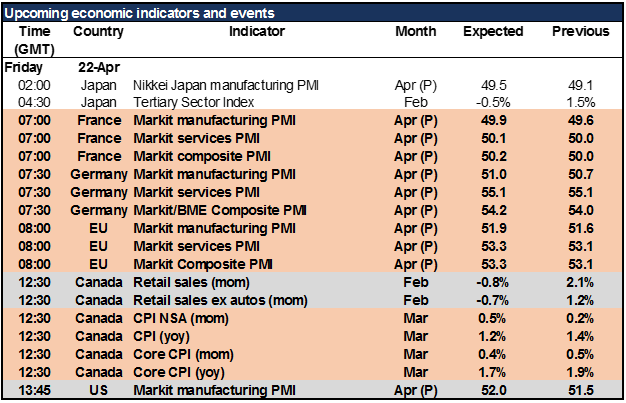 Preliminary PMIs,Canadian retail sales & CPI – Today is PMI day! At least, preliminary PMI day. The day started with the JapanesePMI, which doesn’t seem to move markets at all. Five out of the last six times, USD/JPY has moved only around ±5 pips in the 30 minutes following the release, which is probably what it would do anyway. 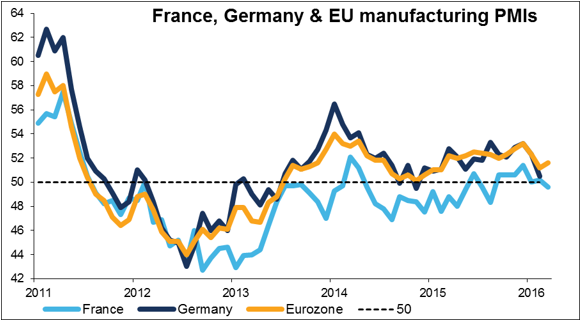 The French manufacturing PMI is reasonably market-affecting and the German one most important, even more than the overall EU PMI, because by the time the EU-wide figure comes out, the market has already moved to take into account the French and German data. Not to mention that EU manufacturing PMI tracks the German figure closely anyway. Market expectations are for all the figures to be either stable or higher, which could prove positive for EUR. Next, the market’s attention will shift to Canada, which announces its retail sales and CPI at the same time. Retail salesare expected to be lower in February, but this is to be expected after the strong January figure, the largest monthly sales gain since March 2010. The modest decline expected would still indicate that the consumption has rebounded from the soft levels of Q4 2015, confirming the Bank of Canada’s view that Q1 growth was probably “unexpectedly strong.” The figure may well be neutral to positive for CAD.